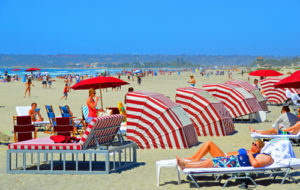 San Diego is known for its zoo, wide sandy beaches, Coronado Island, del Coronado Hotel and rich history dating back to 1769 when the first Europeans arrived. Its Old World charm and contemporary amenities make San Diego the perfect getaway destination. Although 3.3 million residents call this southern California city home, it is very easy to navigate and even easier with a good navigational system. The car I drove during my stay was a 2016 Kia Optima provided by DriveShop. Its navigational system was easy to use and featured a large course-plotting screen. Other features of the car include its easy handling, safety features, luxurious interior and massive trunk; great for road trips, getaway weekends and everyday use. The first day I left Homewood Suites by Hilton and headed south toward the San Diego Zoo. Located in center city, the zoo is part of the 1,200-acre Balboa Park. It was crowded the day I visited so I decided to take advantage of the guided tour bus that travels through 75 percent of the park. In addition to learning about the animals, I also discovered the zoo grew from the exotic animal exhibitions abandoned after the 1915 Panama-California Exposition. It was Dr. Harry M. Wegeforth who founded the Zoological Society of San Diego in 1916 after discovering the animals had been left behind. The zoo pioneered cage-less exhibits. A lion area, designed without enclosing wires, opened in 1922. After the bus ride, I continued to explore a few of the twelve areas of the zoo on foot making lots of discoveries on my own. 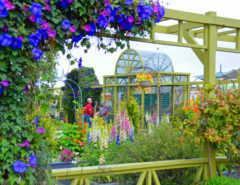 Pathways are lined with beautiful flowers making the journey even more memorable. I arrived in Old Town early. There was plenty of parking available right across from the Old Town Trolley depot and right in the center of the historic area. 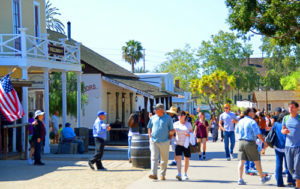 Before or after the trolley tour, you can wander through Old Town. Shopping, dining and history await you here. There are several points of interest, museums and historic homes including The Whaley House. Here you’ll learn about the entrepreneurs who called San Diego home in the mid-1800s, and, according to the Travel Channel’s America’s Most Haunted, the Whaley House is the most haunted house in the United States. 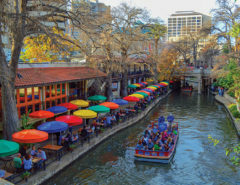 The entire Old Town Trolley tour circuit — with its historic narrative, corny jokes and hop-on, hop-off convenience — takes two hours and is a great introduction to the city. 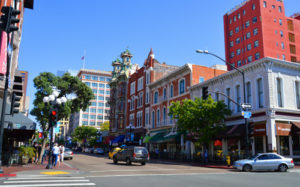 For example the Historic Gaslamp Quarter, offers entertainment, shopping and night life venues, and has a fascinating history. When development began in the 1860s, the area was known as New Town, in contrast to Old Town. In 1850 William Heath Davis bought 160 aces, but little happened until real estate developer Alonza Horton arrived and purchased 800 acres. The area is designed with short blocks and no alleys. Beautiful century-old buildings of varying architectural design line the streets. The trolley rumbled on over the San Diego-Coronado Bridge to Coronado Island. The town of Coronado was incorporated in 1890. Shortly after a resort community was created on land purchased by Elisha Spurr Babcock, Hampton L. Story and Jacob Gruendike. The men also built the world famous Hotel del Coronado. Coronado Museum of History and Art docents lead tours of the hotel every Tuesdays and Fridays at 10:30 a.m. and on Saturdays and Sundays at 2 p.m. Reservations are required. The island has several beaches, great shopping and fantastic restaurants. Friendship Garden of San Diego. 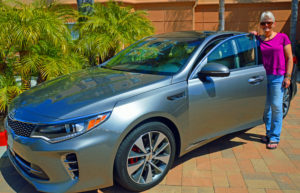 The Kia Optima drove like a dream making the journey to the San Diego Zoo Safari Park an enjoyable experience. 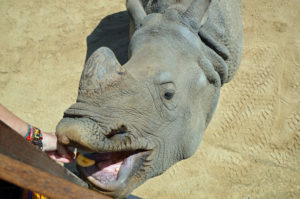 Located north of the city, the zoo takes full advantage of the 1,800-acre expanse by offering several unique up-close interactions with animals. 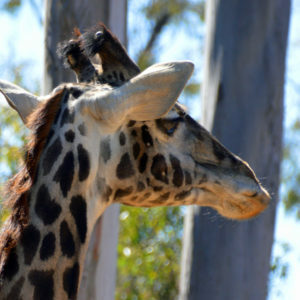 The Caravan Safari, for example, allows guests to feed giraffes and rhinos. At the appointed time I climbed into the back of a rugged truck with several others and had a seat. After entering through massive gates we saw all kinds of African animals and their babies. I was very impressed with the guide/naturalist who knew copious amounts of information about the animals. Past antelope, Nile lechwe and other hoofed animals, the highlight of the journey is when we were allowed to feed giraffes and later rhinos. 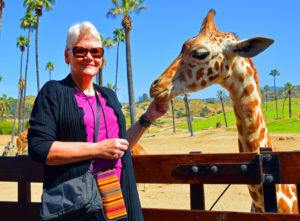 There is so much to do in San Diego, so if you have the time, stay longer. For example, there are several harbor cruise options including a one- or two-hour Flagship Cruises or a 90-minute San Diego SEAL Tour. The “SEAL” is an amphibious vehicles specially designed and built to navigate on sea and land. 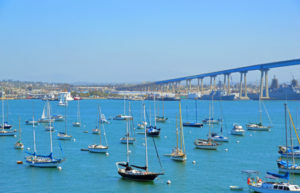 Both tours take you on a cruise of the San Diego Harbor. Flagship Cruises also offers whale watching and dinner cruises. Or enjoy one of the many beaches, museums or lush gardens. For more information check the official San Diego Tourism Authority website. Heya! I just wanted to ask if you ever have any issues with hackers? My last blog (wordpress) was hacked and I ended up losing many months of hard work due to no backup. Do you have any solutions to protect against hackers? Thank you! It was so beautiful and fun in San Diego.